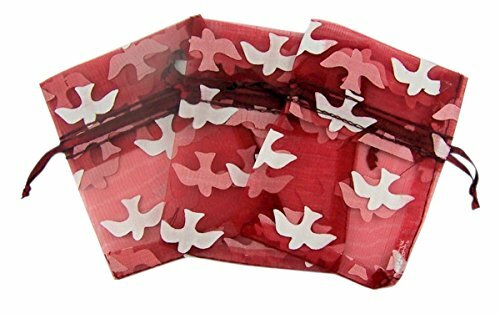 This organza gift bag has a lovely Holy Spirit design and a silky ribbon pull closure. Use for jewelry, pocket tokens, prayer cards, and even rosaries. Makes a great presentation bag for Confirmation gifts. 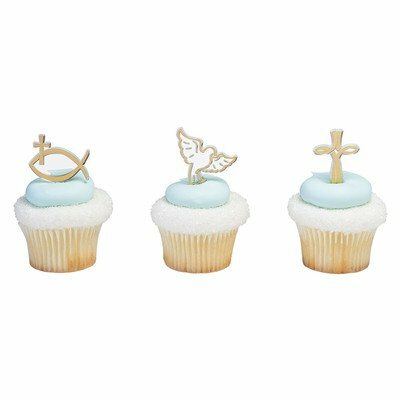 These spiritiual cupcake picks are a dove, cross and fish. 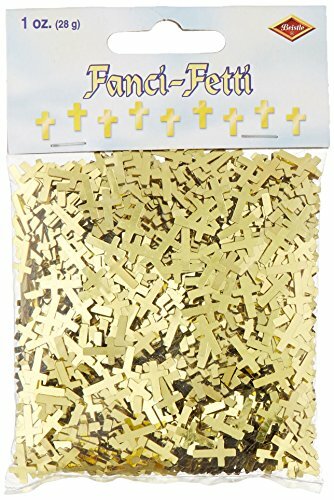 They are all in gold and are great cupcake toppers for First Communion, Baptism or even Confirmation. Each pick measures 3" and you will get 6 assorted. The Perfect Party Supply Bundle for your Blessed Event! Include 91 pieces for 18 people. 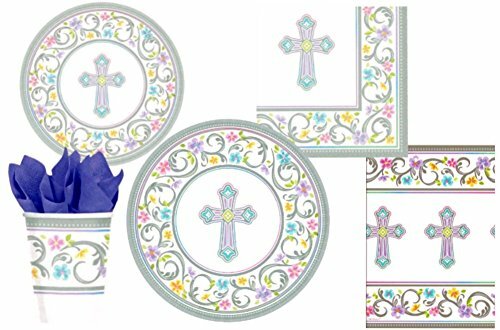 This set includes: (18) 10.5 inch dinner plates, (18) 7 inch dessert plates, (36) Luncheon Napkins, (18) 9 oz. Cups, and (1) Paper Table Cover, 54 inch x 102 inch. 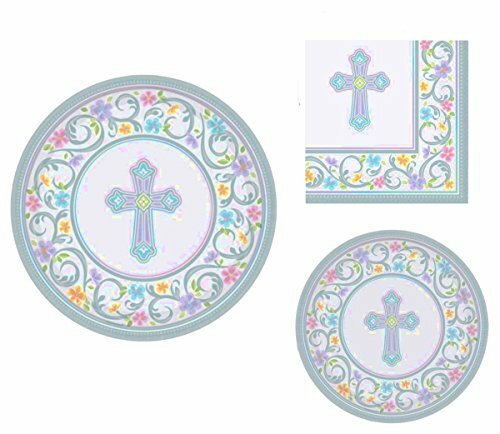 Beautiful & Elegant, this Cross Design is sure to enhance your Easter, Baptism, First Communion, Confirmation, Dedication or Memorial Celebration. Great for VBS too! You won’t have to worry about small food and drink spills with our Radiant Pink Cross Confirmation Party Napkins. Featuring a pink religious design, our paper napkins are just what you need to serve the meal at your daughter’s confirmation party. You can deck out the table with unfolded napkins makeshift place mats. Another idea is wrapping napkins individually around sets of silverware to create convenient cutlery roll-ups. Or simply place the whole stack on the end of your buffet. 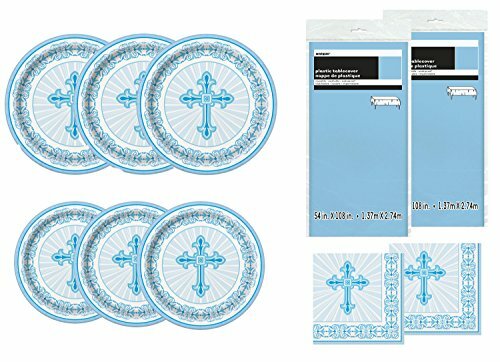 You won’t have to worry about small food and drink spills with our Radiant Blue Cross Confirmation Party Napkins. Featuring a blue religious design, our paper napkins are just what you need to serve the meal at your son's confirmation party. You can deck out the table with unfolded napkins makeshift place mats. Another idea is wrapping napkins individually around sets of silverware to create convenient cutlery roll-ups. Or simply place the whole stack on the end of your buffet. Instantly brighten up any Confirmation celebration with this Foil Gold and Silver Radiant Cross Confirmation Balloon. Tie this Gold and Silver Radiant Cross Confirmation Foil Balloon to the back of the guest of honor's chair or combine it with latex balloons to create a dazzling table centerpiece or balloon bouquet. With its timeless and elegant cross design, this party balloon is ideal for any Confirmation party. Dazzle guests at any Confirmation celebration with this Foil Gold & Silver Radiant Cross Confirmation Banner. 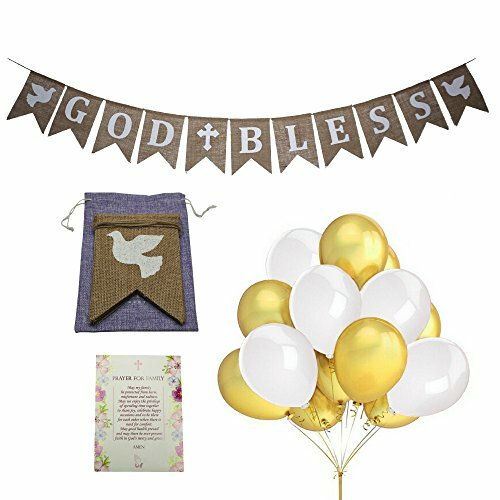 Hang this Gold & Silver Radiant Cross Confirmation Foil Banner behind your buffet or dinner table, or attach it above an entryway to greet guests as soon as they arrive. Featuring a beautiful and elegant cross design, this party banner is ideal for any Confirmation party. Shop our other religious party supplies to plan the perfect event, for an everyday low price. 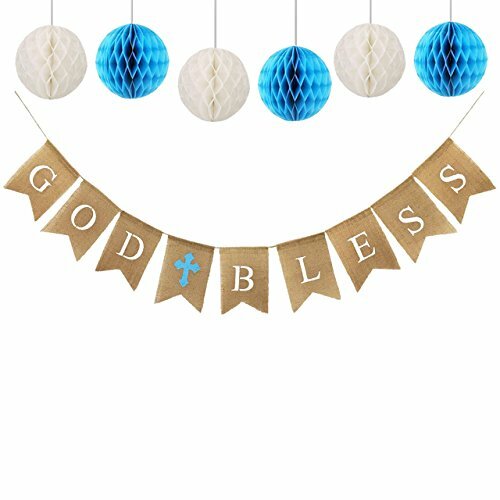 Deck out your celebration space with this Foil Radiant Blue Cross Confirmation Balloon. Adorned with a white dove, this pretty blue balloon makes a sweet addition to your son's confirmation party. Once inflated (balloon ships flat), this helium-quality balloon looks great tied to a party table or chair. You can pair it with other assorted balloons to create a fun balloon bouquet. Or, simply fasten the balloon in front of the house to show guests they have arrived at the right place.